Here’s something different to add to the breakfast menu. 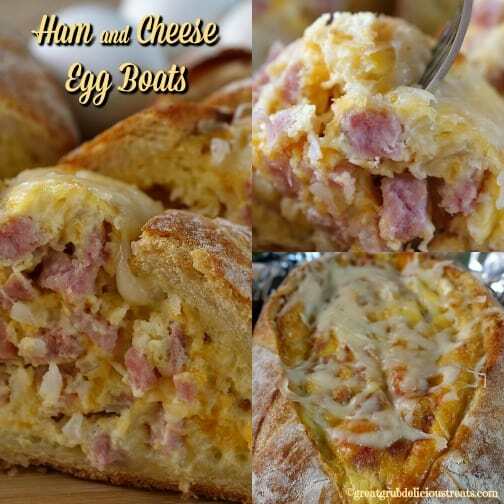 Ham and cheese egg boats are loaded with two different types of cheese, ham, onions and eggs, and then placed into a country french loaf of bread and baked to perfection. 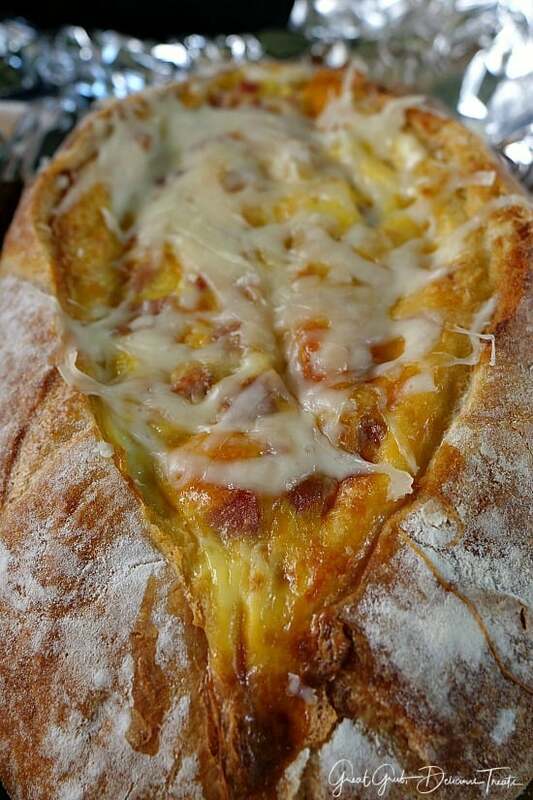 Look at all the goodness stuffed inside this bread. 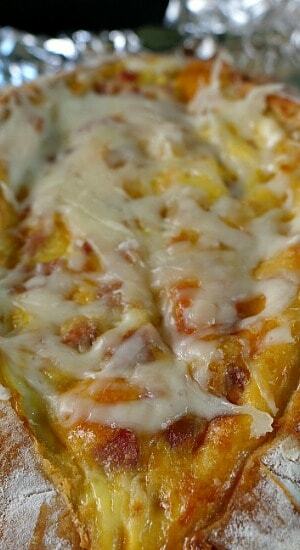 Sausage, bacon, diced bell peppers are also great additions to add to these ham and cheese egg boats. Basically, cut a “v” in the top of both loaves of bread, lengthwise, and remove the inner bread but make sure to leave about 1/2 inch of bread around the inside edges (the country french bread is smaller than a regular loaf of french bread). Dice up the onions and ham and fry for about 5 minutes. 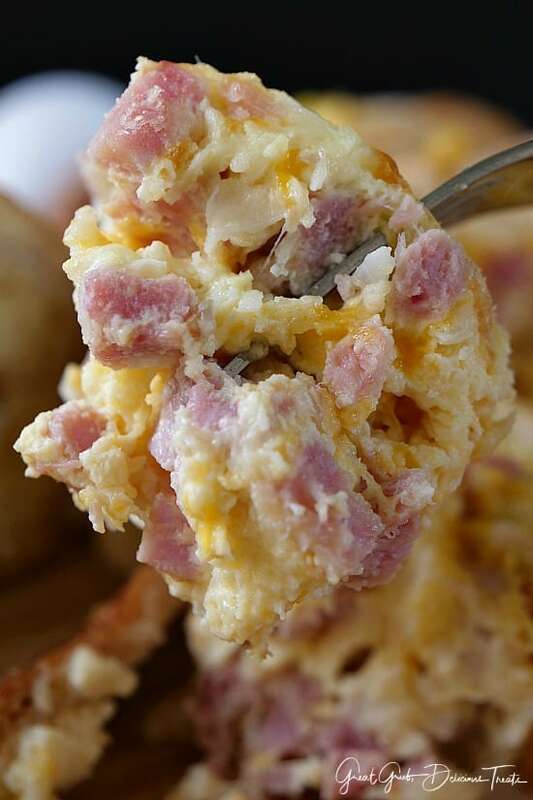 Whisk eggs and heavy cream together, then add onions and ham to the egg mixture. 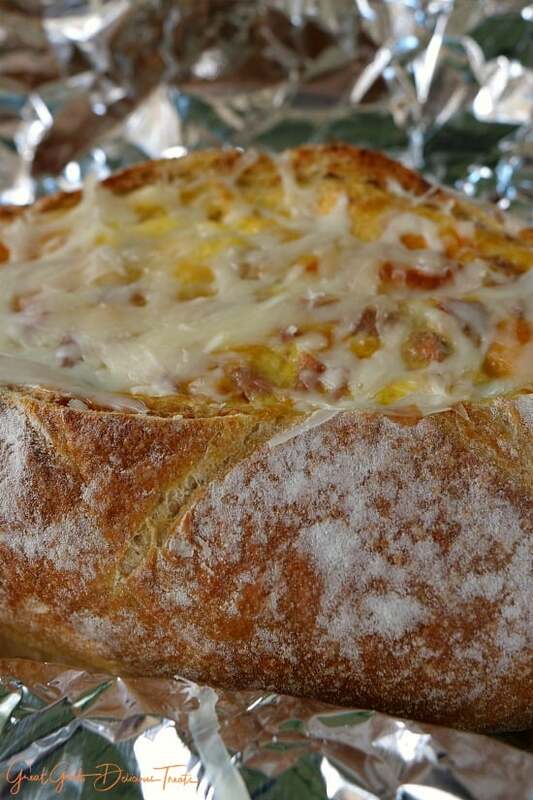 Stir in both cheeses and fill the bread. Replace the top piece of bread, wrap both loaves in foil and baked for 45 – 55 minutes. Once done, remove top piece of bread and add a little more cheese to the top. Slice and enjoy! Any cheese will work in this recipe so add your favorite. Maybe pepper jack and gouda or sharp cheddar and monterey jack. My thoughts, the more cheese the better. Easy, no fuss, and a great change from the normal breakfast. 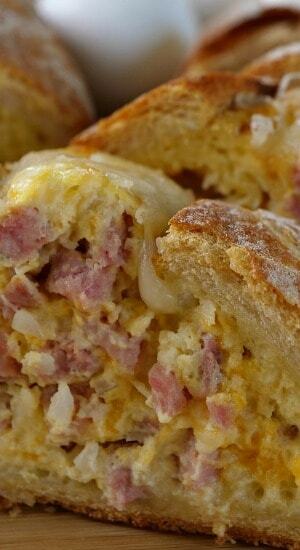 Pop these in the oven and soon everyone will be enjoying a slice or two of these delicious ham and cheese egg boats. 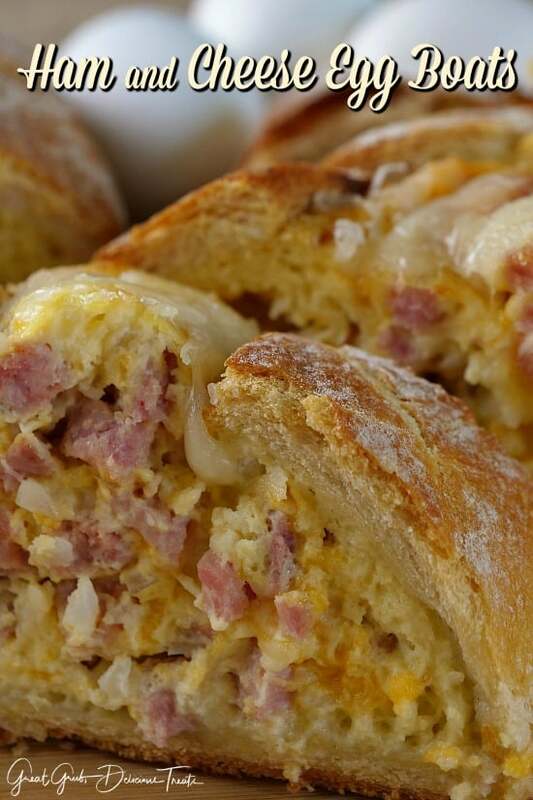 Want a few more delicious breakfast recipes? How about: Fried Egg Grilled Cheese Sandwich, Apple Pecan French Toast, Homemade Sausage Gravy, and Banana Nut Filled Pancakes. Check out all my breakfast recipes. In a medium mixing bowl, whisk eggs, heavy cream, garlic salt, salt and pepper together until combined. In a large frying pan, cook onions and ham for about 5 minutes then add to egg mixture. Stir in both cheeses and mix well. Cut a v-shape cut lengthwise in the top of both loaves of bread. Remove the inner bread, leaving about 1/2 - 3/4 inch along the bottom and sides. Wrap in foil and bake for 45-55 minutes. Remove foil and continue baking until done. 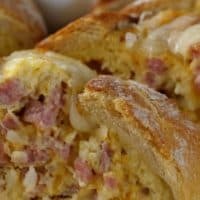 Do you cook the eggs before adding them to the bread?